← update – to buy, or not to buy. 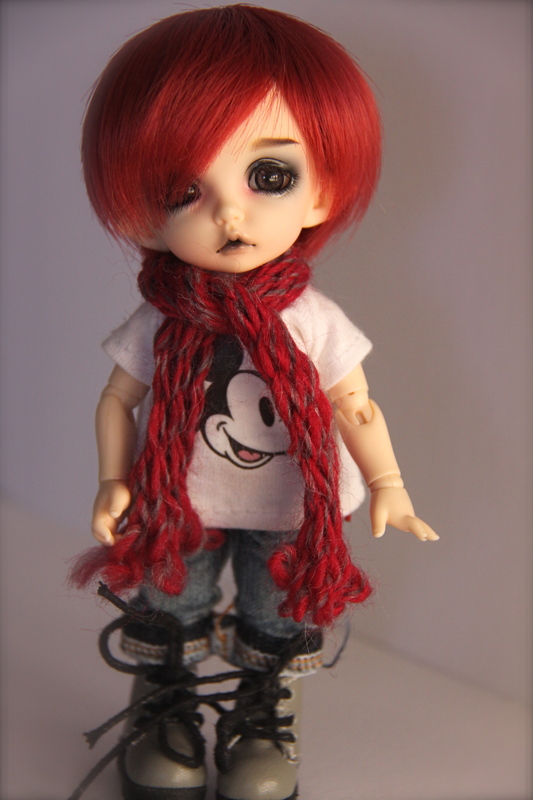 the third Pukifee to join my crew (as a full-bodied doll, anyway) was my little sweetheart, Gabriel. something about the Pio sculpt really called to me, but i had concerns about the default faceup – it just looked so, so dark for a little boy. * additionally, Pio wasn’t (and still isn’t) a very popular sculpt, so owner pics were very hard to come by. regardless, i decided to take my chances and i purchased him through layaway from Denver Doll. Pio is such a cute sculpt! i love his chubby little chipmunk cheeks and big eyes (though i didn’t love the fact that he was sent with light blue eyes – they were waaay too light and creepy for his dark faceup). 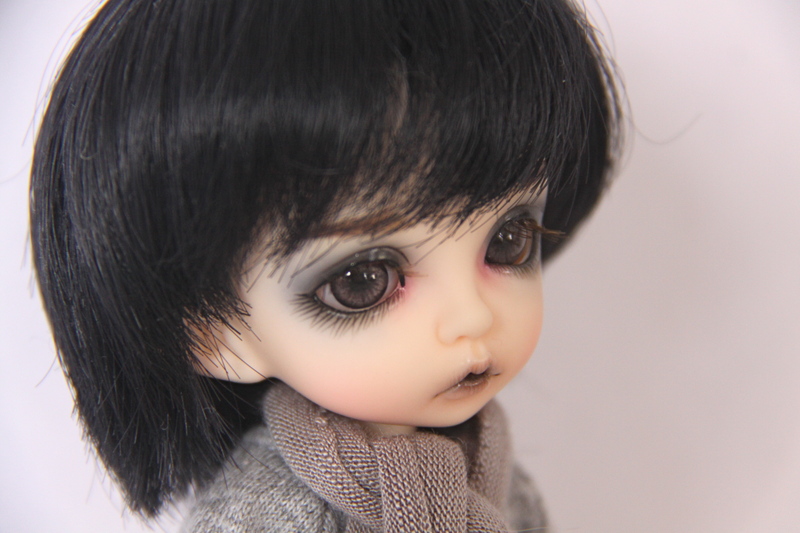 and i was pleased to really love his faceup – it wasn’t too dark at all. 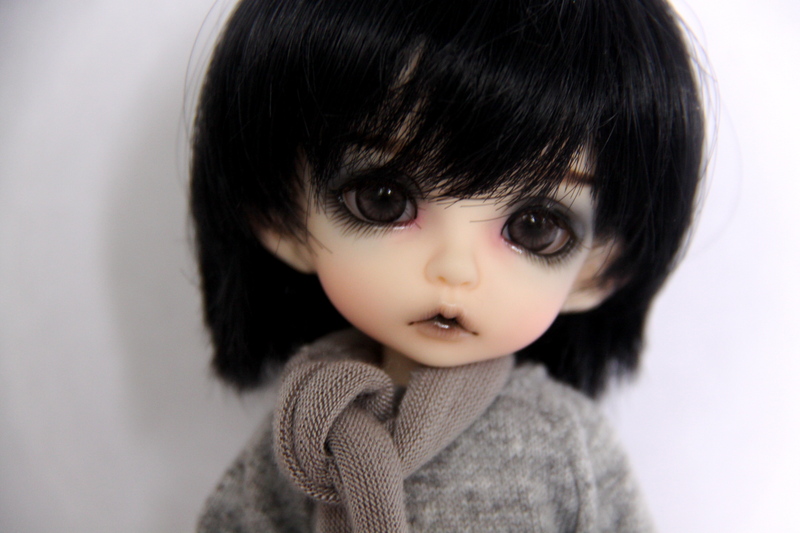 i had ordered some grey eyes for him and a black wig – my aim was to try and enhance the darkness of his faceup – and it was a really cute look. he would have stayed that way except that i had bought a red wig from Rapunzel Wigs on a bit of a whim (on a side note, i really wish she would restock as she has such adorable wigs) and it looked amazing on him. so now he switches between both wigs, simply because i think he is adorable in both! *i know that i could have bought him blank, and sent him off for a faceup, but i was still fairly new to the hobby, and i did not know of many faceup artists – and none local – and shipping from Australia to elsewhere is very expensive, so i was trying to minimise costs by purchasing the default. 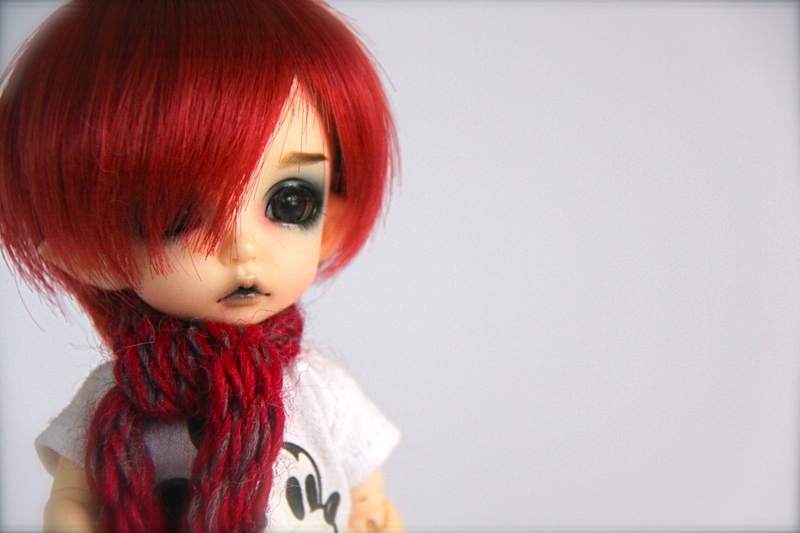 I think Pio is a lovely sculpt, but it is sometimes difficult to tell how dark a face-up really is on the screen . . . sometimes you need to take a leap of faith. I agree about the eye change, much better and I like both wigs.